If you were in Room 2111 in the Steven G. Mihaylo Hall at Cal State Fullerton between the hours of 2:45-3:05 PM on Saturday (11/26/14), then you probably noticed a couple things: 1) Our team looks damn good in suits. 2) Team UV considered the use of Contracted and Loaded Tip (CLT) technology in our propulsor design. Naturally you may have asked, “What in the heck is CLT?” Well do not worry, I’m here to feed you some knowledge lil guppies. The CLT propeller spawned after claims of potential advantages of loaded tip propulsion were published for Tip Vortex Free propellers in 1976. CLT propellers became a fully realized propeller type when the contraction of the fluid vein across the blade at the tip was considered to be defining the geometry of the propeller. So what makes a propeller a “CLT” propeller? First off, the tip chord is finite, it does not just fade away to the root of the blade. Secondly, an end plate fitted at the blade tip located on the pressure side operates as a barrier to avoid the communication of water between the pressure and suction side (this gives a finite load at the tip of the blade). Thirdly, pitch increases from the root to the tip of the blades and there is low to moderate skew on the blade itself. And fourthly, the actual tip bears a substantial load. 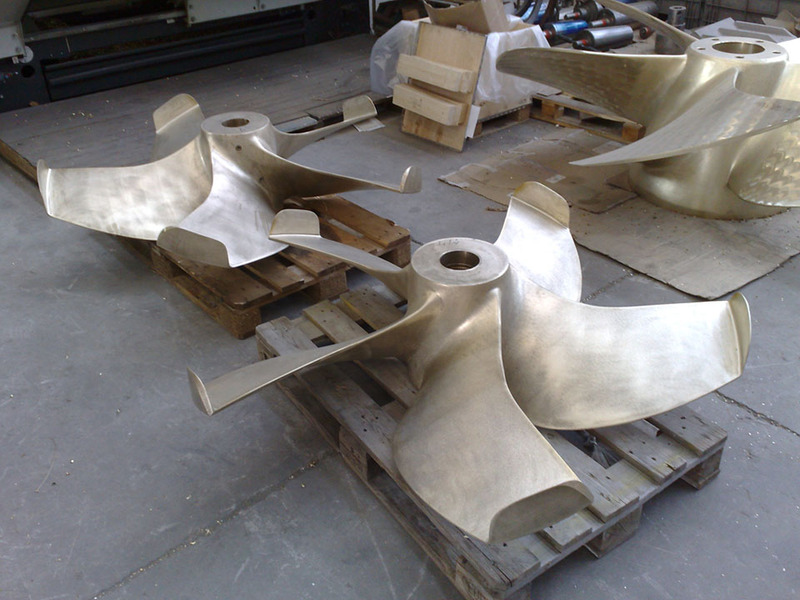 Fundamentally the goal of the CLT propeller is to improve open water efficiency. This means that the tip on the propeller reduces the velocities of water entering the propeller disk which, in turn, reduces the hydrodynamic pitch angle. This reduction of hydrodynamic pitch angle and induced velocities results in many advantages. To list a few, CLT propellers have higher efficiency (5-8%) resulting in fuel savings, reduced emissions, saving on maintenance, and achieving higher top speeds. CLT also inhibits cavitation and tip vortices, resulting in less noise, less vibrations, lower pressure pulses, and lower area ratios. CLT also achieves greater thrust, smaller optimum propeller diameter, and better maneuverability. And if that wasn’t enough, incorporation of CLT propellers does not require any major redesign and CLT propellers can be easily retrofitted into existing buildings and vessels. Model tests and experimental data have shown how awesome CLT propellers can be and recent results with newly developed Computational Fluid Dynamics (CFD) codes show great promise in optimizing the design. Everyone from the US Navy to Carnival cruises is getting in on the CLT technology. ← Research Conference & Fundraising!